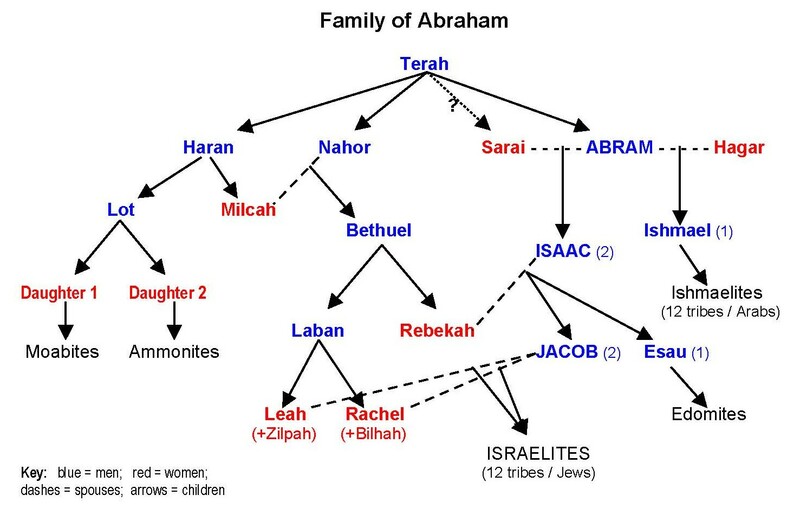 Various biblical passages describe the complex inter-relationships in the family of Abraham (originally named Abram). Contrary to modern Western customs, it was acceptable in ancient times to marry close family relatives, including cousins and nieces. It was evidently also common for men to have more than one wife, and even to have children with women who were not their wives (slaves or concubines). For example, Abraham's first son was the child of his wife's slave-girl; and one biblical tradition even says that his wife, Sarah, was actually his half-sister. 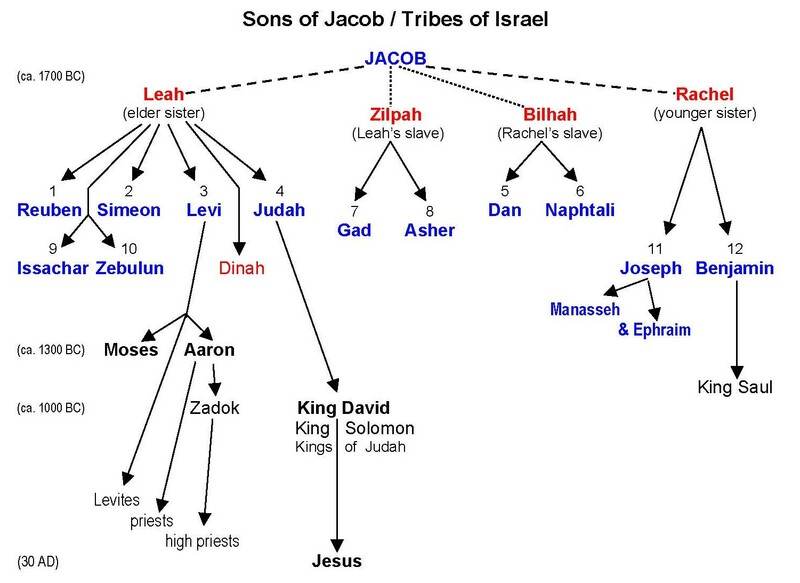 Similarly, the twelve sons of Jacob have four different mothers: the two wives of Jacob (who are his first cousins) and two other women (slave-girls of his wives). A prominent feature of the biblical texts is also the explanation of tribal origins through various genealogies. Thus, the Israelites (the twelve tribes of Israel) see themselves as the descendants of the twelve sons of Jacob, son of Isaac, son of Abraham. In contrast, groups like the Ishmaelites and Edomites (to the south and southeast of the Israelites) are said to be descendants of Abraham's other children and grandchildren, while the neighboring Moabites and Ammonites (west of Israel) are described as descendants of Lot, Abraham's nephew. Another important aspect of the biblical stories is what could be called family rivalries and disputes, esp. when younger sons usurp the inheritance rights of their older brothers. Thus, Abraham's inheritance is passed on to Isaac (not the first-born Ishmael), and then to Jacob (not his elder brother Esau). Combining all the above points helps to explain both the close relationships and the bitter rivalries between the ancient Israelites and the neighboring Semitic peoples. The Israelites (and modern Jews!) believe that the promises God made to Abraham (esp. that his descendants shall possess the Promised Land forever) were legitimately handed on to them through Isaac and Jacob (as described in the Bible), while the descendants of the other tribes (and modern Arabs!) believe that the land should belong to them, since they are descendants of the elder sons (and thus the rightful heirs) of Abraham. Terah: from Ur of the Chaldeans; has three sons; wife not named (11:26-32; cf. Luke 3:34). Haran: dies in Ur before his father dies; wife not named; son Lot, daughters Milcah & Iscah (11:27-28). Nahor: marries Milcah, daughter of his brother Haran (11:29); have eight sons, incl. Bethuel (22:20-24). Abram: main character of Gen 12–25; recipient of God's promises; name changed to ABRAHAM (17:5); sons Ishmael (by Hagar) and Isaac (by Sarah); after Sarah's death, takes another wife, Keturah, who has six sons (25:1-4), including Midian, ancestor of the Midianites (37:28-36). Lot: son of Haran, thus nephew of Abram, who takes care of him (11:27–14:16; 18:17–19:29); wife and two daughters never named; widowed daughters sleep with their father and bear sons, who become ancestors of the Moabites and Ammonites (19:30-38). Sarai: Abram's wife, thus Terah's daughter-in-law (11:29-31); Abram also calls her his "sister," which seems deceptive in one story (12:10-20); but in another story Abram insists she really is his half-sister (his father's daughter by another wife; 20:1-18); originally childless, but in old age has a son, Isaac (16:1–21:7); name changed to SARAH (17:15); dies and is buried in Hebron (23:1-20). Hagar: Sarah's Egyptian slave-girl; mother of Abram's first son, Ishmael; much conflict with Sarah after his birth; even more after the birth of Sarah's son, Isaac (16:1–21:21). Isaac: second son of Abraham, by wife Sarah, despite her old age (17:15-21; 21:1–35:29); marries Rebekah, who has twin sons, Esau & Jacob. Betheul: youngest son of Nahor & Milcah; wife unnamed; father of Rebekah (22:23) and Laban (24:29). Rebekah: daughter of Bethuel (22:23); becomes wife of Isaac (24:15–25:20); favors their younger son. Laban: son of Bethuel, brother of Rebekah; has extensive interactions with Jacob (24:29–31:55). Esau: elder twin son of Isaac & Rebekah (25:25); names of wives differ in two traditions (26:34 & 28:9 vs. 36:2-3); one is a daughter of Ishmael; his sons are ancestors of the Edomites (36:1-43). The Bible says very little else about the "Twelve Tribes of Ismaelites" aside from naming the twelve sons of Ishmael in Gen 25:12-16 and again in 1 Chron 1:29-31. Gen 25:12-16 – "These are the descendants of Ishmael, Abraham's son, whom Hagar the Egyptian, Sarah's slave-girl, bore to Abraham./ These are the names of the sons of Ishmael, named in the order of their birth: Nebaioth, the firstborn of Ishmael; and Kedar, Adbeel, Mibsam, / Mishma, Dumah, Massa, / Hadad, Tema, Jetur, Naphish, and Kedemah. / These are the sons of Ishmael and these are their names, by their villages and by their encampments, twelve princes according to their tribes." 1 Chron 1:29-31 – "These are their genealogies: the firstborn of Ishmael, Nebaioth; and Kedar, Adbeel, Mibsam, / Mishma, Dumah, Massa, Hadad, Tema, / Jetur, Naphish, and Kedemah. These are the sons of Ishmael." Hadad - not mentioned elsewhere, but several other biblical characters are named Hadad, Ben-Hadad, Hadadezer, etc. Reuben is the first-born son, and thus sometimes exercises a leadership role among his brothers; but he later loses favor and prominence. The tribe of Joseph (through his sons Manasseh and Ephraim) becomes the largest and most prominent by the time the Israelites enter the Promised Land and divide it among themselves. The tribe of Levi is uniquely important, not only because of Moses and Aaron, but since they become the priestly tribe (all the sons of Levi are priests, while members of any other tribe cannot be priests). The Levites do not receive a separate territory of their own, but rather live scattered among all the other tribes, where they serve as priests for the whole people. Although the first king of Israel (Saul) is from the tribe of Benjamin, the tribe of Judah becomes known as the royal tribe, due to the promise God makes to King David that his descendants will rule over Israel forever (2 Sam 7). Jacob's twelve sons are first mentioned in the order of their births, in Genesis 29:31–30:24 & 35:16-20.